Kirk House is situated approximately six miles from the centre of Belfast is a well-established residential area. It is within walking distance of shops, health centre, post office and is on a main bus route. The recently landscaped grounds are laid out in lawns and flower beds, with patio and seating areas which are easily accessible. Forty-two individual flatlets, four of which have been designed for couples, and two of which are suitable for disabled residents. There are also communal dining and social areas. Each flatlet has its own front door with door bell and letter box. In 2014, Kirk House adapted one wing into ‘Memory Lane’, providing safe and supportive accommodation for nine residents with dementia. 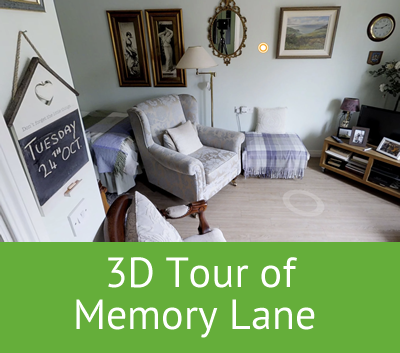 In Memory Lane major changes were made to residents’ flats and communal areas, combining a cutting edge approach to dementia design with a homely feel to make residents more comfortable and independent and reduce confusion. Features such as contrasting colours and bright lighting, work alongside personal touches like encouraging residents to choose the colour and number of their own front door to help them find their way. These features also help with retaining memory. All staff throughout Kirk House, including catering and housekeeping, have completed Dementia Friends training, with Care Staff also completing Best Practice in Dementia Care. "You strike up good friendships. It's like home, but on a corridor... not an avenue."